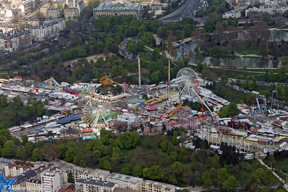 Paris’s annual La Foire du Trone, a huge carnival with rides, attractions and lots of amusement park food and treats, opened this past weekend in the Bois de Vincennes in the city’s 12th Arrondissement and will be open daily for the next two months. 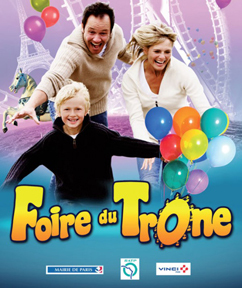 With more than 300 attractions, the Foire du Trone, roughly translated as “Fair of the Throne,” attracts as many as 5 million visitors each year, including scores of Parisian families since the carnival has a large number of rides, shows and entertainment for children. 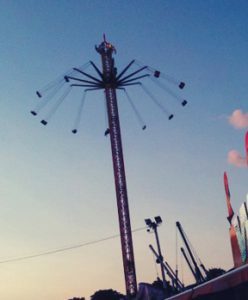 “Max Power,” another thrill ride that operates as a large pendulum that moves at speeds of more than 55 miles per hour. And, of course, the fair is ground zero for sweets, treats and artery-clogging food, including candy apples, churros, marshmallows, burgers, hot dogs, ice cream, frites and more. 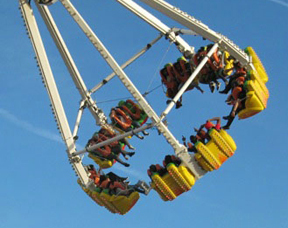 Organized by the Mairie de Paris (City of Paris), La Foire du Trone is an annual festival that takes its roots from the spring sale of gingerbread by the Abbaye Saint-Antoine-des-Champs that started more than a millennium ago in the year 957. The sale became so popular that it eventually morphed into a larger bread and grain marketplace, first called “Foire aux Pains d’Epices (Gingerbread Fair)” and held near Paris’s Place de Nation (formerly called Place du Trone).Over the centuries, the festival grew to a two-month affair and was held in various other locations in Paris to accommodate growing crowds. It was moved to its current location on the Pelouse de Reuilly (Reuilly Lawn) in the Bois des Vincennes in 1965. In addition to the daily rides, shows and attractions, several special events are held each year during the fair. Upcoming shows include fireworks and a parade on May 1, a Portuguese festival on May 10, and a special closing celebration on May 16. The festival is open daily through May 25 from noon to midnight Sunday-Friday and from noon to 1 a.m. Saturdays. La Foire du Trone is accessible by Metro from stations Porte de Charenton, Porte Doree and Liberte, and is about a 20- to 25-minute subway ride from Central Paris. 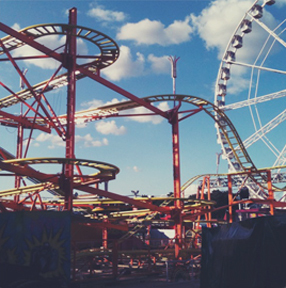 Admission to the fair is free; prices of rides vary, usually beginning at around 2 euros for children’s rides. Food and carnival games also are priced individually. Visitors also can buy a park pass for about 30 euros that provides a number of free rides and deep discounts for additional rides and attractions. This entry was posted in Annual Events, Entertainment and tagged amusement park, Foire du Trone by Bob Adams. Bookmark the permalink.